Aaron Willis and his wife, Nosara native Silvia Noguera Matarrita currently build and renovate homes through Guanacaste Builders, and service swimming pools from Samara to San Juanillo via Pelican Pools. Yet despite the focus on building, Willis’ passion is for mountain biking, riding daily from work site to work site along the dusty roads of Nosara, and completing arduous rides in distant locations such as Morocco and Utah. Willis and Noguera purchased Playa Bikes this past winter and transformed it into a unique retail experience. Nosara Bike Works is the storefront which offers basic to high end mountain bikes, for sale and rent, and related accessories such as seats, gloves, tire pumps, helmets, tubes and chains. Shimano trained mechanic William Venegas is available for repairs and Willis invites “anyone can come in and fill up their tires or borrow a wrench and do some repairs out back,” he said. But Willis’ true passion for mountain biking comes out in the addition of bike tours and professional bike team sponsorship via the Dale Duro! brand. His Dale Duro! team leads mountain bike tours throughout the area for several hours or down the coast for a few days. Dale Duro!’s other activity is sponsoring local professional rider Jairo Cordero Hernandez. 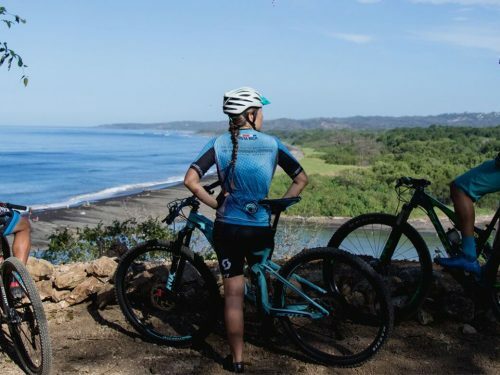 Cordero recently finished first and third in major Nicoya races and is training for upcoming endurance races in the mountains around San Jose. “There are good riders out here at the beach and I want to make sure they can train and enter races without worrying about the fees and equipment,” Willis said. He and Cordero have their eyes on Costa Rica’s famous, extremely difficult Los Conquistadores mountain race next November. Nosara Bike Works offers high end mountain bikes from the brand Niner for $2, 500 to $4,500, medium range La Pierre bikes for $750 to $1,500 and basic Super Pros for $180 to $300. They also sell beach cruisers and offer layaway financing plans to buy on credit. Dale Duro! and Dale Duro! Chavala branded t-shirts, hats and bike jerseys are also available. Dale Duro! tours range from $45 to $85 for daily adventures. For prices for overnight trips, contact the store directly.